This is a 3rd or 4th incarnation of a severely underexposed shot. 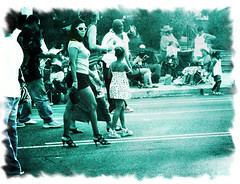 Shot this at a local jazz festival in the West Oak Lane Section of Philadelphia last summer. I REALLY was tryin to get the taller lady in frame, but the one with the sunglasses stepped into frame as I snapped . I Like the effect you used on this picture! it really brings out the lady who you didnt mean to capture. Thank you Amanda. I agree. The lady in the sunglasses is now the center of attention.